M brother Pierre lives in Arbis, a tiny village close to Bordeaux, I don’t get to see him half as much as I would like to. So for his birthday, I decided to spend a bit of quality time with him at least on paper… Pierre loves Tintin so much that for his 30th birthday, he dyed his hair and got some blue contact lenses to turn himself into his beloved Belgian journalist for a night of fancy cartoon heroes (I went as Cruella Deville). And so Pierre in the style of Herge had to be. His other cartoon hero is Gaston Lagaffe, whose catchphrase is ‘M’enfin! ?’ (could be translated roughly as ‘mmmwhat?’) – and which bro has adopted as his motto. 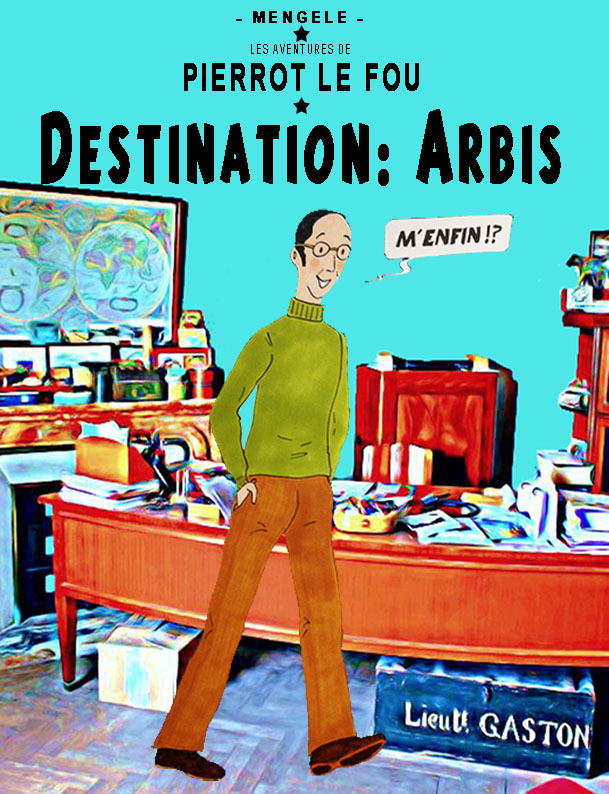 So here I’ve used an image of Pierre’s actual office in Arbis, ‘cartoonised’ it to create a Tintin-like cover. The box under the desk has not been added for effect, it’s actually real and belonged to my parents’ landlord in Toulouse, the eminently holy Monseigneur Gaston (an archbishop), who had been in the wars as a lieutenant in his younger days. Big bro has a lot of nicknames, Pierrot le fou and Mengele being two of them, so they went in too. It doesn’t hurt either that one of the colloquiums for being mad in French is ‘zinzin’ – suspiciously close to Tintin, non?